What: We can’t understand the human being who wouldn’t look at this photo and not try to eat it straight from the screen. (Whether you’re hungover or not.) At Sardella in St. Louis, chef Gerard Craft reinvented this BLT as a breakfast sandwich, but keeps it on for lunch because it’s just that popular. 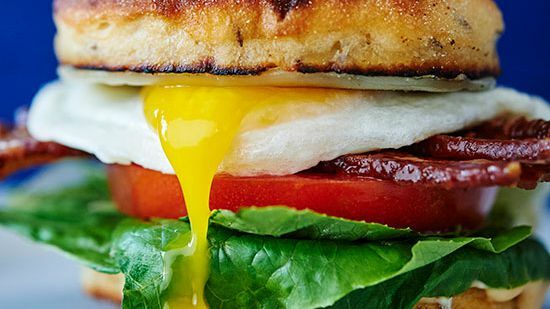 Bacon, lettuce, tomato, and that drippy-yolked egg are a perfect combination — elevated by Burgers’ Smokehouse Bacon, a homemade English muffin, and hot sauce aioli. Wash it down with: Hold off on the booze in favor of a clever matcha hot chocolate.